As this year’s Ramadan fell right into the children’s summer break. I wanted to take advantage of it to get them involved in some gardening and teach them not only about plants but also about what a great opportunity to do charity it would be. Giving sadaqah in the this blessed months brings great reward. 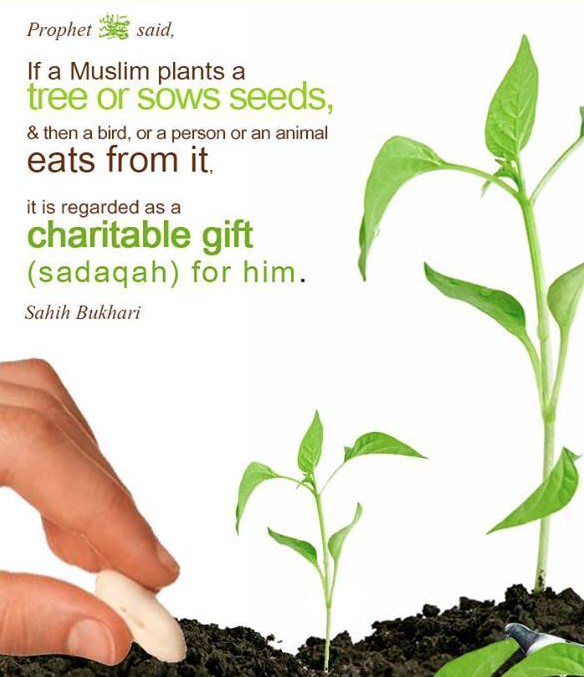 However often sadaqah is equated to money or material things. Often a child is unable give these type of charity. Through this gardening activities I hope to teach my children that there are other ways of giving charity and planting is one of it. We live in a climate where it is not wise to plant outdoors until after third week of May. Bearing this is mind we started planting seeds indoors in April! This proofed to be a challenge. Things grew and quickly died off as I could not transfer them outdoor and was not capable keeping them thriving and alive indoor. However, the boys were still eager to get their hands dirty. School came to and end in June. The one weekend before Ramadan, we went to the garden centre and everyone got to pick something to plant and nurture. We embarked on our little gardening challenge for the season. I love using picture books to teach, so to supplement this hands on learning with some good dosage of Islamic teaching I purchased this book. 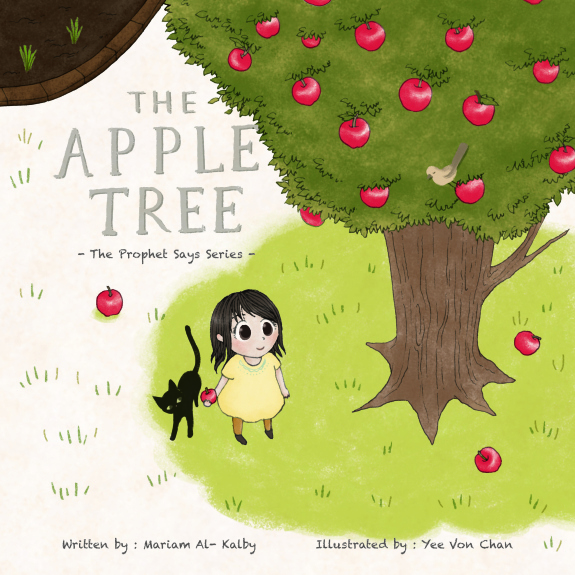 The story is about a little girl called Shaima that plants an apple seed with her dad. She is told about the great reward of planting a tree. When the tree bears fruit though, Shaima finds it hard to share it with anyone. She faces various incidents that persuades her to reluctantly share. Once she gives in, her reluctance is replaced with gladness and happiness. She finally realizes planting the seed and sharing its fruit is truly a means to earn the reward and pleasure of Allah Ta’ala. You can learn more about this books at Mariam Al-Kalby’s website A Pocket Full of Notes. The enchanting illustration that brings this book to life was done by a fellow Malaysian, Chan Yee Voon. More of her work is at http://www.chanyeevon.com. 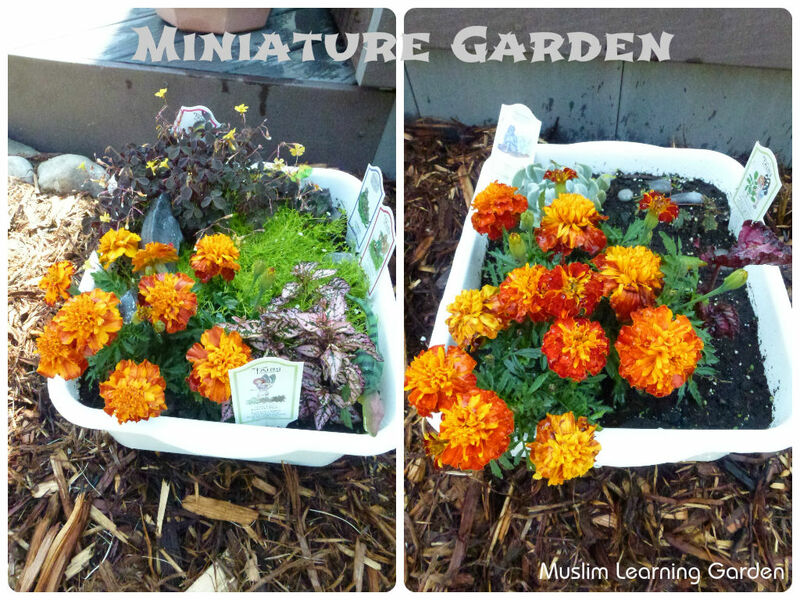 This gardening project has been mainly for Ilyaas (7) and Zakariyya (5). Ibraheem (11), lets say is sort of out of commission as he has been fasting 18 hour days. He however has been helping with watering the grass and mowing our out-of-town friend’s lawn. The first thing we planted was a miniature garden for the two boys. I got dollar store dish pans and drilled holes in them to use them as planters. In these tubs we planted succulents, miniature grass, touch-me-not plant, marigold and other plants that I do not know their names. The boys wanted their garden to be prehistoric one and added dinosaurs and pebbles to it. Zakariyya’s (5) is on the left and is thriving. Ilyaas’ (7) is sort of struggling. Again, opportunity to remind that we can make the effort and it’s Allah’s decree if it will grow. We also got various vegetable and flowering plants. All of it was planted into pots as I am more accustomed to container gardening. 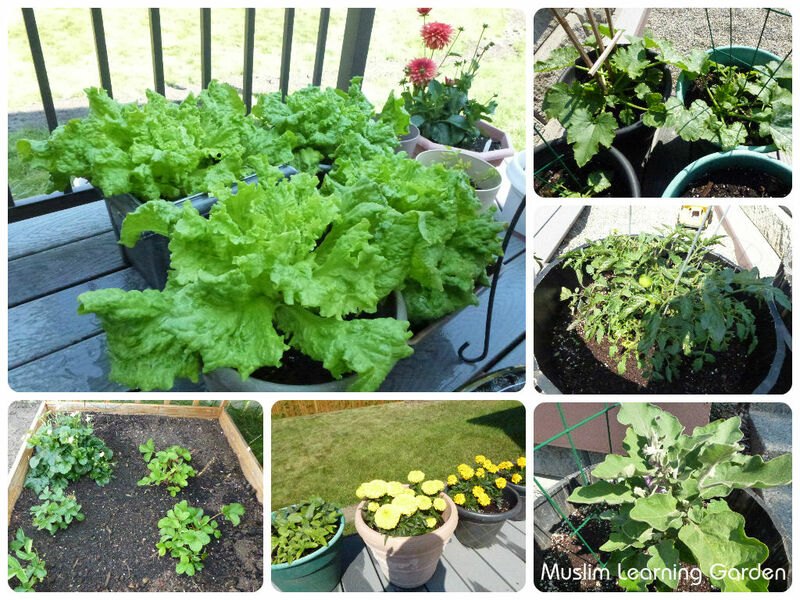 Of all the vegetables we planted, the lettuce was thriving Masha-Allah. 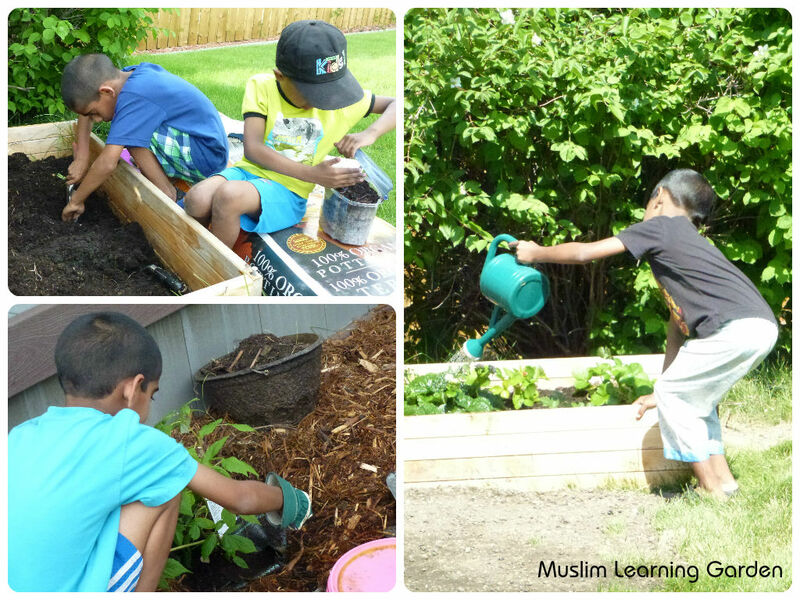 Ilyaas (7) has become a salad maker for the family, a good deed activity this Ramadan. We have so much lettuce that we started sending them to our friends. Again referring to the hadith, the boys were pleased that this is a form of good deed too. A very special thanks to our friends who graciously accepted our lettuce. Besides the vegetables, we cleared the planter box we installed last year and planted strawberry plants. The two boys worked hard at this. During the process of preparing the box, the were thrilled to find worms! So we made a worm farm. This is our second year doing a worm farm. We just use an old beta fish aquarium for this. Zakariyya (5) can be seen busy fillling the tub with worms in the picture below. Details of creating a worm farm can be found here. This is one of the most exciting things for the boys. Often checking on the tunnels that the worms make. We eventually released the worms back into the planter box. We also had a chance to plant a couple of rasberry bushes. The probably will not fruit this season. I hope they will live to see next season, Insha-Allah. Overall the two boys have been busy watering, weeding, picking out dead flowers and leafs and harvesting their hard work. We get bees that come to the flowers, birds we haven’t seen and hares have so far not eaten anything. Many people have eaten from our plants though. The greatest pleasure is in seeing the boys enjoying and taking pride in their work. I keep reminding them that these are all good deeds that we do to seek Allah’s pleasure and hope for his reward.